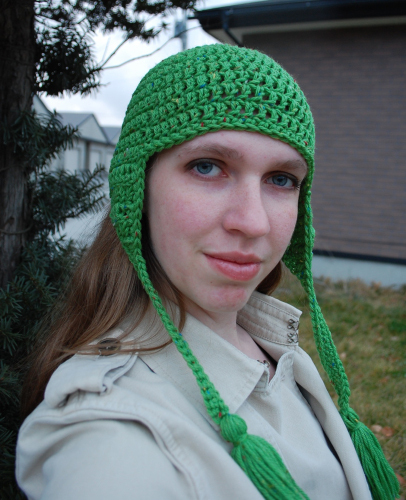 Here’s the next pattern in the continuing effort to relocate my patterns from Crochet Uncut: Kirsten. “A playful tasseled hat, crocheted in a beautiful rich color, is sure to brighten even the grayest day this winter. It’s quick, too! Double crochet, a large hook, and a lovely wool all combine to create a delicious fabric that proves something doesn’t need to be difficult to make a statement. Rnd 1: Ch 3. Make 12 dc in third ch from hook, join with sl st in first dc. Without breaking yarn, begin first Ear Flap. Row 6: Ch 2, yo, pull up loop in each of next 4 dc, yo, pull through all loops but one, yo, pull through two loops. Ch 20. Fasten off, leaving an 18″ tail of yarn. Skip 20 stitches of Hat’s round 11, join new yarn in next stitch. Repeat directions for Ear Flap. Join new yarn where Ear Flap meets Hat. Ch 1, sc around edge by placing 1 sc in each dc around and spacing them as evenly as possible along edge of the Ear Flap. When you reach the ch-20, sc in each ch down to tip, make 3 sc in tip of ch to turn, sc in each ch along other side back up to Ear Flap. Repeat along other side until you reach the starting point. Join with a sl st and fasten off. Wrap 10 yds of yarn around cardboard piece. Thread needle with tail left at end of ch-20: take it through one end of tassel-loops a few times to secure. Slide tassel off cardboard. Secure tassel to hat with a few stitches. Wrap yarn around and through tassel-loops about 3/4″ from top as many times as possible, secure ends. Cut loops at bottom, trim ends if needed. Finishing: Weave in ends. Wash and block as needed.